Stephen Harper's problem is that he thinks too small. No short-term partisan advantage is too minute for him to pursue and no long-term challenge facing the country is too large for him to ignore. By contrast, we need national leaders who will think forward and think big; who will govern intelligently and respectfully; who will call for a new federalism for the 21st century. The current scandals enveloping the Senate and the Prime Minister's Office are simply the most visible symptom of the Conservative government's approach to managing the nation's affairs. 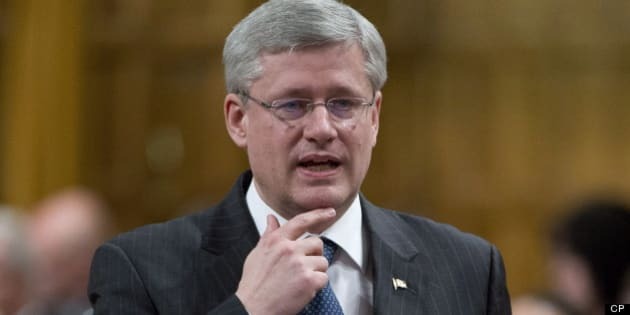 Stephen Harper leads an unprecedentedly insular and partisan national government -- a government that has perfected slice-and-dice incremental politics to the point of self-destruction. And now the emperor has no clothes -- standing for nothing but narrow self-interest, incapable of operating beyond the shortest of time horizons, unable even to pretend to engage Canadians in pursuing a vision of a better Canada. Harper's proposed changes to the Senate appointment process allowing à la carte elections are now bogged down in a Supreme Court of Canada reference and are completely overwhelmed by the expense scandal. These proposals are typical of this government -- a government uninterested in intelligent governance and the long-term national interest. With a government focused solely on pandering to special interests in a way that translates into specific blocks of votes in the next election, Canadians can be forgiven for having no real idea about what should be the 21st-century role of the Senate in representing regional or minority interests in the Canadian federation. With no substantive leadership from the Prime Minister on this issue, it is of little surprise that some Canadians just throw up their hands and opt for Senate abolition. The Harper Conservatives ignore, to their peril, the principle that intelligent governance means obtaining the engaged and informed consent of the people. The politics of spin and manipulation will ultimately collapse. Mr. Harper's palpable failure to tackle the fundamentals of so many issues and engage Canadians in serious debate characterizes every aspect of the now seven-plus years of his do-nothing, directionless government. And Canadians acknowledge this. In a recent EKOS poll, 50 per cent of those surveyed say the country is moving in the wrong direction (up from 30 per cent, five years ago) and an even higher 57 per cent say the government is moving in the wrong direction. Little wonder, then, that very few Canadians can think of anything memorable that could constitute some sort of positive legacy for the Harper years. For example, Canada has been spectacularly unsuccessful under Stephen Harper in concluding meaningful trade deals that would significantly benefit our economy. Why? In part because the federal government has failed to lead an initiative to remove interprovincial barriers to trade and mobility, and ensure that Canada comes to the negotiating table with a coherent position. Canada is failing at training Canadians, especially our young people, for the skills that are actually in demand and lead to meaningful jobs. Why? The Harper government controversially tinkers with EI instead of sitting down with all the provincial governments, educational institutions, and private sector players to coordinate the provision of extensive apprenticeship and training, as in Germany. And then counterproductive tinkering in one area leads to more counterproductive tinkering in another area. So we are served up immigration reforms and programs like the Temporary Foreign Worker Program to fill the skills gap faced by employers, which in turn create more problems than solutions. Canada is facing a crippling infrastructure deficit in all our towns and cities. Without dramatic action, our economy will lack the solid foundation it needs to grow and prosper and our children will face enormous expenditures. Yet the federal government contents itself with stopgap measures -- tinkering with tax revenues here, or a loan guarantee there. Our tax system is increasingly unfair and incomprehensible, and riddled more than ever with exemptions that provide some individuals and businesses with breaks they do not need, while low-income people who want to get ahead are held back by counter-productive rules and regulations. And development of our natural resources is proceeding apace without long-term guidance by independent science and stringent environmental standards, and an extraordinarily short-sighted federal government that actively opposes establishing a national price for carbon despite support from both business and environmental groups. Stephen Harper's problem is that he thinks too small. No short-term partisan advantage is too minute for him to pursue and no long-term challenge facing the country is too large for him to ignore. By contrast, we need national leaders who will think forward and think big; who will govern intelligently and respectfully; who will call for a new federalism for the 21st century that -- whether through constitutional reform and a new Senate or through a new administrative body like a Council of Canadian Governments -- will bring governments and Canadians to the table in the national interest and who will re-imagine the role of national government as essential to creating the long-term foundations for strong and sustainable economic growth.